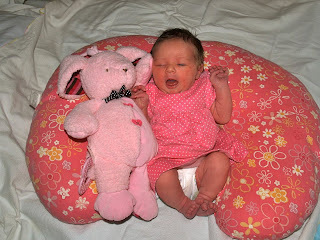 It was at 7:46AM one year ago today that our Miss Anika Iris Kathryn quietly came into the world. 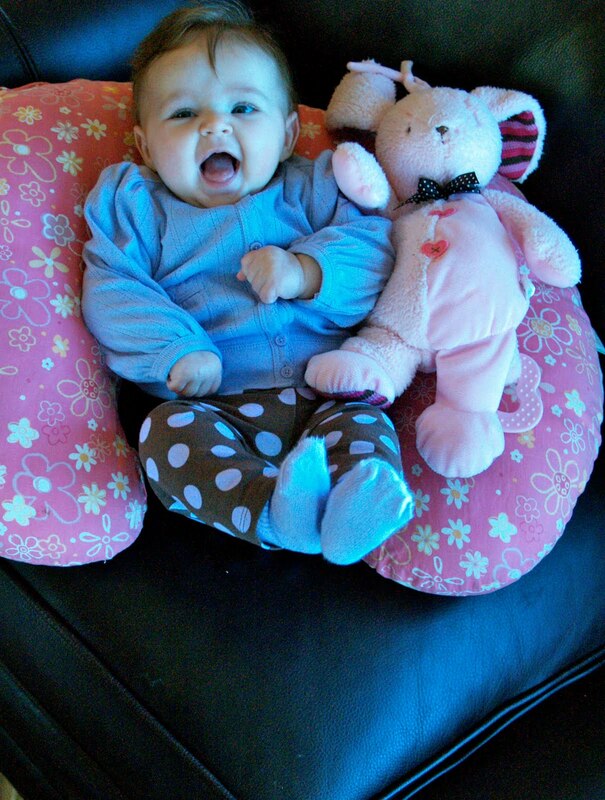 She is an amazing blessing and melts our hearts every day. 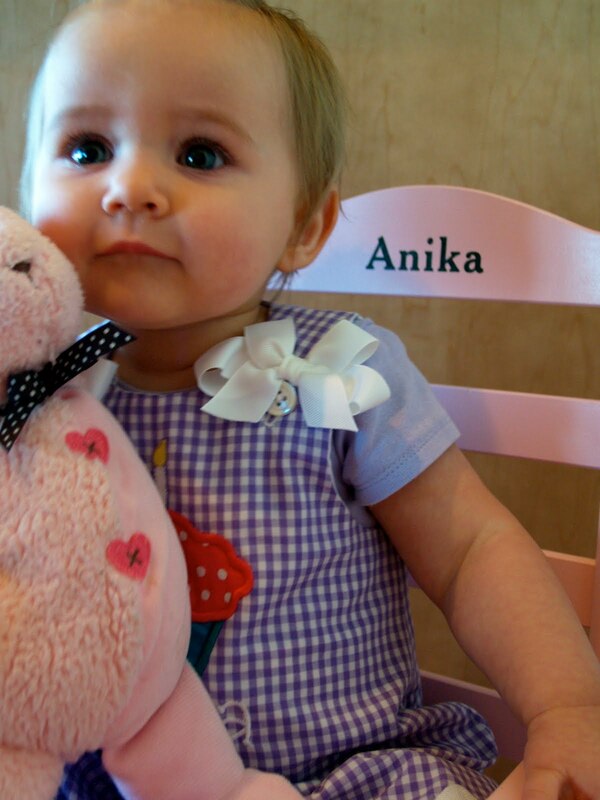 Anika looks like her daddy. 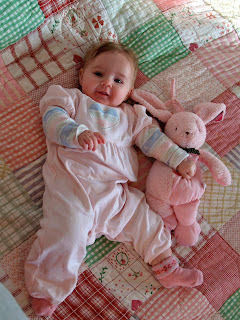 She is patient, content and the kindest little one year old you will ever meet. Today we are celebrating her first birthday, her golden birthday, together as a family with several friends joining us at our house tonight for a summer barbecue. She is wearing her special dress with her name on it. We can find her sister’s name in stores monogrammed on dresses or hair bows. 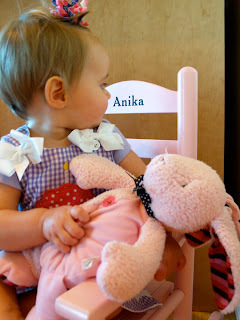 But when your name is as Scandinavian as Anika we have to do a little searching. The beauty of connecting through social media, online shopping and fast shipping, we had this dress made and delivered to us from Texas. This is a custom dress from Ashley at SheSheMade. It was our first purchase from Ashley but I will be a frequent customer for both girls. It was so much fun to get this dress in the mail and Anika will be wearing often this month!Each month, Anika has taken her picture with the pink bunny that her daddy bought for her the day she was born. 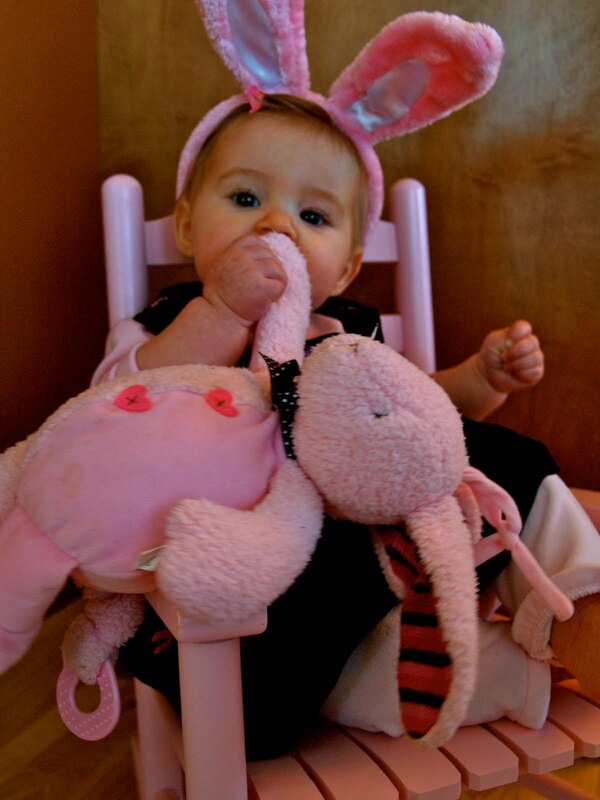 The bunny is named “Hop Hop”. 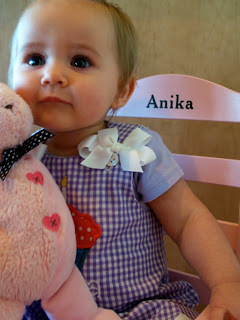 Hop Hop is a good ol’ friend to Anika now. At age one, Anika has taken a few solo steps but still prefers to drop to her knees and crawl. She is a speedy crawling machine. She continues to be the best mannered baby but the toddler in her is coming of age. 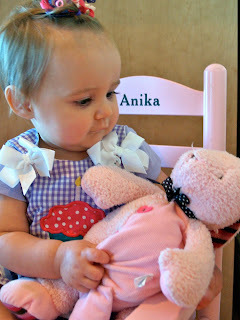 Anika’s opinions are now being heard. She prefers me holding her and if I am not doing so or taking her to Lori’s daycare, she lets us all know she is not happy. Of course it breaks my heart and I have to give her extra hugs and kisses. Anika remains toothless. The latest teething baby I have ever known but our pediatrician laughs at me and says not to worry. She eats plenty of table food now, wants to feed herself but we still need to give her some baby food because the girl doesn’t have teeth. 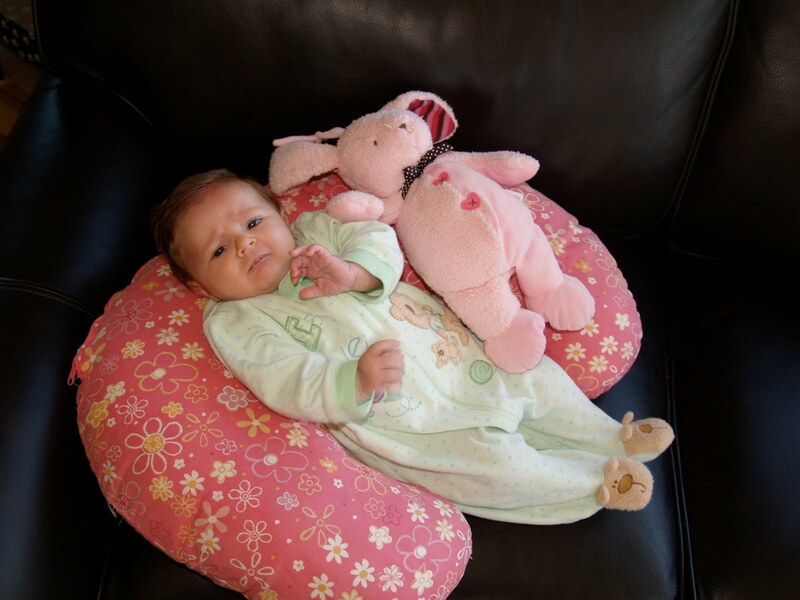 She is transitioning into drinking cow’s milk and doesn’t seem to mind the change. She loves drinking from her sippy cups but still is going to be getting a bottle before her 12 hour slumber each night. The books say to quit the bottle now. This mama says…soon but not yet.Our sweet baby girl is saying a few words. “Dada” “Mama” “Dat u” for thank you. Last night she said “Nana” when Daddy said he was taking her over to see Nana (Grandma Carol). 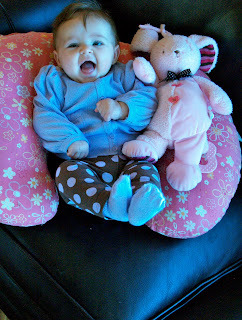 She babbles plenty and our theory is she may just start talking in sentences when she has teeth! A quick look back at the past year with Hop Hop. In the adjustment to having three kids and the flurry of the summer, I missed taking a picture on August 1. But we made up for it the remainder of the year. 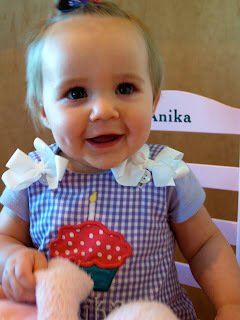 Happy, Happy Birthday Miss Anika!! It’s hard to believe that she’s a year old! Enjoy the day!! 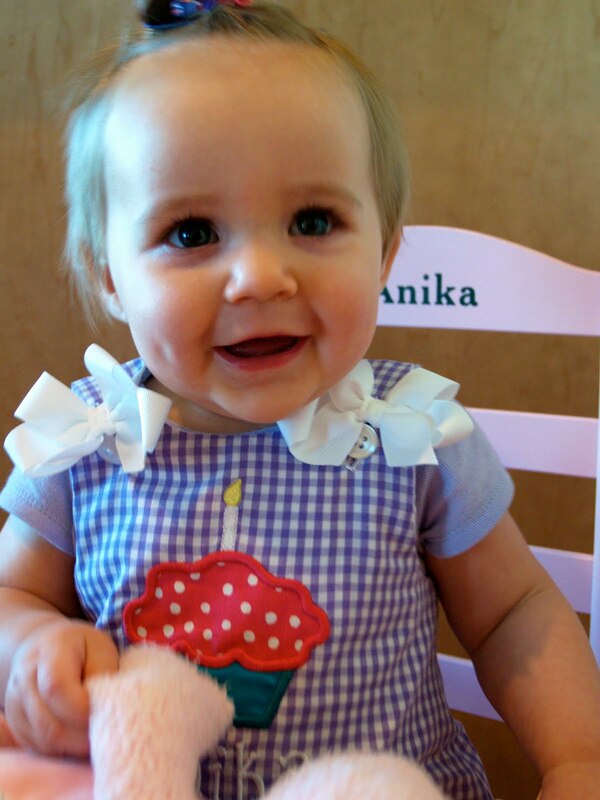 Happy 1st Birthday Anika! One year can go so fast. 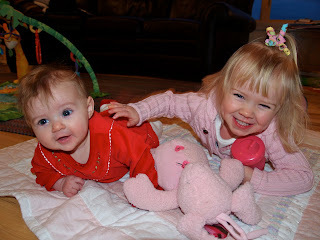 Hopefully soon she can play again with her friend Lucas. Have a wonderful day. s 1st birthday. How they grow so fast 🙁 Enjoy your day with your family!!! 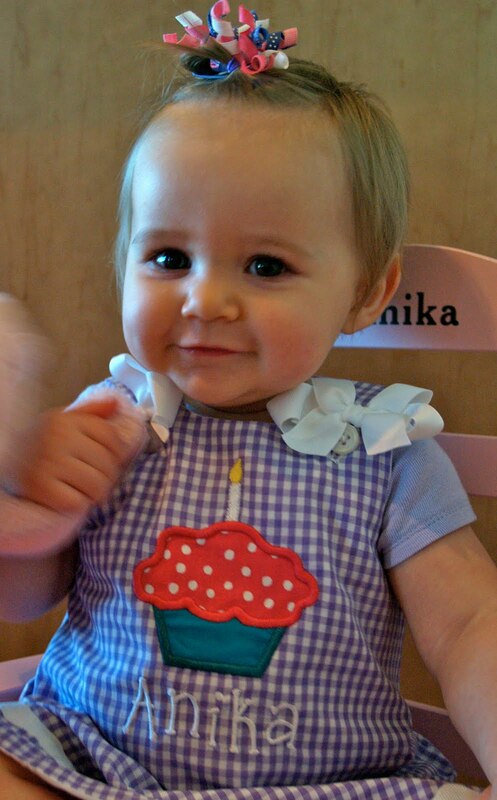 Happy Birthday Anika! I love the dress you had made! That is such a cute idea. I will have to do that for Miss Lily! I love having a girl! Can’t wait for our girls to meet someday! 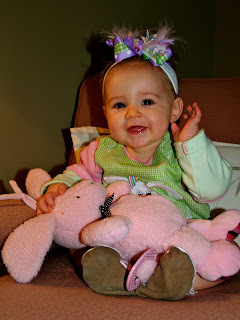 Happy Birthday sweet baby girl! You are so precious…can’t wait to see all the wonderful plans God has in store for your life! 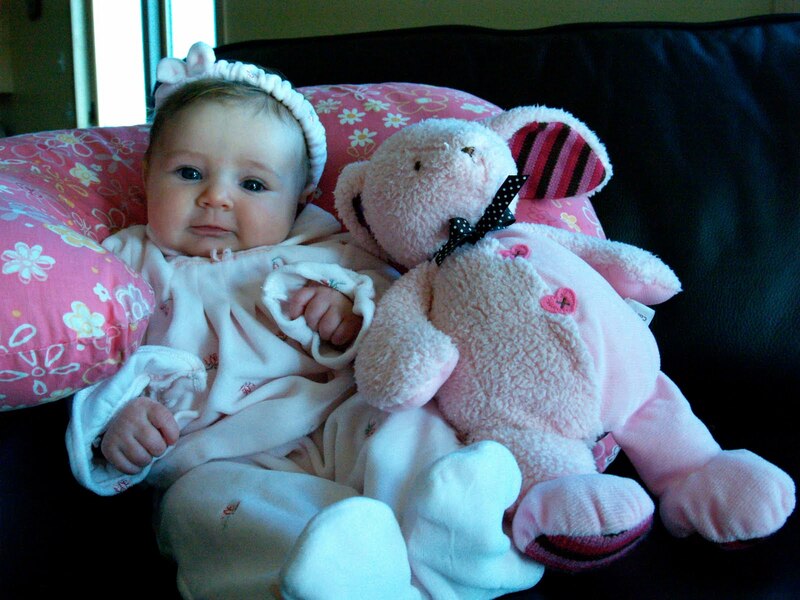 Love from Tennessee…Randy, Katie, Rody, and Anna Kate…. 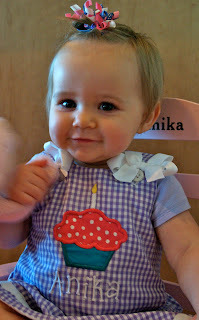 Happy Birthday Anika! And thanks so much for mentioning SheShe Made in your blog. We love the social network/blog world and good people such as yourself to spread the word. That is a great idea to take a picture every month with the same animal. . . very fun. Looks like she had a fun birthday bash! !